The world began in fire. It will end in fire. And death will reign all during the in-between. The horizon caught ablaze as the day descended for its western rest, spilling red tongues of flame across the darkening sky. Each revolution of sun and moon granted the daylight kingdom a shorter reign, a sure sign of winter's whispers coming to pass. A chill had settled despite the heavenly burn, and the earth shivered with a cold fever. Or so it seemed, in all but one place. All but here. In the very heart of Helovia its pulse beat strong with an insurmountable warmth. The gaping maw of hell crackled and burned continuously, its inner light extending as the out light drew away. Heat wafted from its burning ring, beckoning, like a finger curling in, body hidden around the corner. Come, it seemed to say, persuasive and sickly sweet as its embers popped and its flames snapped, scorching earth and air alike. Fire is greedy that way, but it doesn't take without giving. What it consumes it returns with blessed light and saving warmth. What it destroys it fertilizes, clearing the old to make way for the new. So it had always been, so it would always be. Like an exhale of fume and used breath, the sound rushed and rustled through the tall, dying grasses, sending them to sway with its echo. The sound cut through the creeping winter wind, winding up and over, again and again. The fire sang for its friend death, because amid the rubble they had kinship left unexplored. "Dei-mos," it continued to breath, the flames pulsing with every ignited heave. The maw of the world had never seemed so fitting as it spoke and funneled long drawn lungs into use. Coals like eyes glowered into the growing dark, while ash fell away like spittle as its lips and its teeth gnashed with ember and fire. "DEIMOS!" it bellowed, smoke curling like a tongue as it forgot to ask and demanded. There are many callings in life; some which can be ignored, some which we pretend to ignore, and some which we can do nothing other than answer. For a beast so in control, for a monster so readily composed, it was difficult to admit when he was lost. But it’d all happened so slowly, a trickling, eclipsing noose, tied knot-by-knot, inch-by-inch, until suddenly it was strapped, pulled, and tightened around his neck, choking, strangling, and suffocating, and he had nowhere to go. The gnarls and wires were marks of his failure, the cycle of steps he’d taken again and again, never realizing how deeply he’d entrenched himself. Reaching out to Huyana, bearing children, becoming Lord and King – all magnificent highlights, all anointed, consecrated favors – but what had he done after? What good was his crown? What deeds and duties had he possessed, had he seized? War? Battles? Defenses? Brooding? What would he be remembered for, when his body collapsed into the soil, when his cold, nefarious heart ultimately failed him? His silence? His nonchalance? His arrogance? His powers? It would never be for how much he adored his herd, his brethren, or his kin, because he never told them, because he hoped somehow, someway, his actions conveyed all these sentiments, that his muted reticence forged bloodthirsty whims and sinister requiems: how he protected, how he shielded, how he thrust his sword, his rapier, his cutlass and blade into monsters, into fathoms, into pestilence for them – always for them. But the Reaper had spun his own maze, his own web, his own labyrinth, entombed his soul in the longest reaches of claws and catacombs, fastened his entity, his presence, into the icy summits and barricaded himself from the aches, from the pains, from the numbing anxieties of the day. He didn’t get close to them. He didn’t them about himself, and he didn’t query for their secrets. He didn’t smile for them. He didn’t ask for their support, and didn’t lend his wisdom. He permitted them to live amongst the valleys without ever knowing the monster, the guard, the demon or infidel marching across the borders, patrolling the wilderness, sinking faster and faster into the wake of the earth. Eventually he’d likely be in Hell and never know it for weeks later – too festered, too succumbed. He’d cycled back upon his old antics, when his life took a fatal turn, when his touch grasped and clenched and wielded death; hiding, shirking, doing naught but fighting cretins, fighting fools, fighting at growth, at resolution, at the crowd nestled within the Basin, at the walls closing in all around him. It took Ophelia, with all her screeching, with all her banshee antics, with her renouncement and abandonment, to realize perhaps he was truly nothing after all. When everything was over and done, what had he accomplished for the Basin? So, the northern Lord wandered out of his empire, trailed after fire and brimstone, rampaged in stony fixtures and abolished ruins, neither screamed nor bellowed, but echoed in a widening abyss of predator movements; stalking the midnight oils, scaling the mountain heights, beating and bleeding a sinuous torture, a benign, numbing tension. He tore into his self-made warren and growled at its clawing, rasping talons, leaned into the irreverent doldrums, composed bitter, rancorous songs of death and damnation, labored through them in his constant, potent silence. He became shadow and hollowness, empty, void, listless and languid, a satanic, rippling bolero of sinister, routine upheaval, spreading sedition through his veins, through his lungs, through his skull until it defined a maddening, stinging, irritating pulse, and he’d somehow managed to surrender to the chasm, to the rifts, in his entity. The Reaper was nothing. The Reaper was no one. The Heart beat with newly found life, thrumming and pulsing in tempo to the Reaper's own bloodied organ. Somewhere within a presence stirred, pulling heat and flame from the gaping maw of the eternally burning depths. It sang, even if it went unheard, growing in volume as the titan of the north approached. The dark name no longer crackled free into the air, because now it listened, and waited, expectant as the air of winter settled between the hooves and the crater's edge. At his one, single word, an ancient inferno surged back into existence. 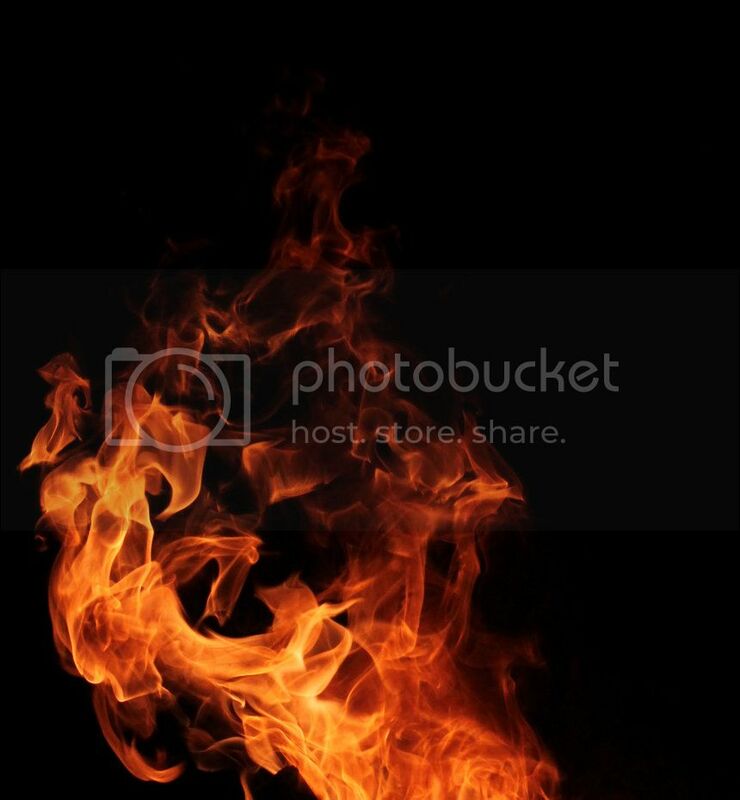 A pyre erupted from the Heart, shooting up like some devilish whale spewing ash instead of condensation. As the flare subsided, embers and soot rained gently down, the first snow of the season and it was hellfire- fitting. As children make snowmen, so too did this pale powder take shape, drifting seemingly into place as it churned through the cutting zephyrs. Piece by piece, Ignatius built himself up from the exhaust of the wounded earth. Decorated in fragile flakes of ash, he stood as pewter and mottled as ever before. From the spaces where the soot did not align, a faint red glow escaped into the dark, proof of the embers that held up his shape; of the burning core that he had decomposed into that fateful night on those jagged mountain tops. His gaze leered as burning holes, set carefully, purposefully, upon the son which he had beckoned to. The son that walked a wayward path of self-ruination and relentless isolation. He would have smiled at that, if he remembered how, because their similarities, whether flawed or chiseled into perfection, were striking. "Yes, Deimos," he said as the last particles of his tail swept into place, dark spots of burnt timber and grass. His voice, though understandable, came out distorted and rough, like talking between old and cracked walls that had filled themselves with dust and memories which held them better than mortar and stone. The sound was earthy, gravelly even, for all of its buried and lost usages. In response to his rumble, the heart gave a small flare, connected to the Fire Sword that whispered in the dark. He had come for a purpose other than the beauty of existing once more (if it could be called that even), but in this moment, the old king of the tides forgot his way, stunned as he was by the boy he'd left behind now grown, beard and all. Had time really passed so swiftly? It seems he was just standing on that shore, singing to Linatai and chastising Cyrene. If fire had eroded all of him, why had it left behind things which could still wound and burn? Grunting, Ignatius tried to shake away such baleful thoughts, tossing his head which bore the tined horn of his old lineage, and letting his full tail wash his flanks. As he moved, debris rained free, crackling and dying out as their heat and their light left. "You've grown into such a fine king, my son." Flames poured into life, death flickered and flared into sentience, ash and soot and embers coiled and curled into one massive, lingering frame: one he’d always cherished, one he’d always remembered, one he’d always craved. He watched, eyes widened, stony mask tossed and forgotten, gaping and staring as his sire, torched and scorched and gone from his life so many seasons ago, returned in a violent, vehement volcano. Not entirely whole, not entirely the beast set upon the moonlit tides, but enough to reflect, enough to rejoice, enough to love. The son, with his enamored silence, with his muted, entranced form, absorbed and studied and examined, tried to piece together the how, the why, the ways in which the Firesword had returned, until the fathoms were too much, and he took to just gazing again. There were so many things to say, so many words he itched and clambered for, so many assurances and hopes and aspirations fueled by desire to reach his father, incensed by the failures of long ago, contorted and contained by the oaths, by the assurances, by the creeds Ignatius had taught him while they stole across sands, while they feasted on hate, while they balanced and nestled on familial pursuits. But all that tumbled from his gaping mouth were quiet, boyish whispers, captured and bottled, seized and possessed, a scion bowing before his predecessor, a child’s heart beating in wonder and inspiration. “I have missed you.” The Reaper took careful steps forward, not striving to touch, to embrace, to hold (because what if the necromancy sought betrayal, and aimed to annihilate all over again? ), but to bask in the glow of his parent’s might, of his protection, of his guidance, of his wisdom and power and everything else in between – just to remain, chiseled in the warmth, the fire, of ages lost and cretins slain. The monster wasn’t sure what his father saw, for all he could proclaim was existence, wars, and shadows: he hadn’t grown, he hadn’t stretched, he hadn’t poured every assurance into his kingdom. No fine king – perhaps a calculating one, maybe a silent one, but never fine. There was naught tied to his rule but threads of contemplation and tenacity, plunging after infidels rushing into his home, stabbing webs of deceit, unleashing torrents of anger, but he couldn’t claim anything else. What had he done for his herd? What had he done for the world? Irritating bobs of virtue still existed. Vile beasts like Confutatis still prevailed and survived. If he didn’t reign, the Basin would still be the same, locked and guarded amongst time, snow, and labyrinths. It was agonizing to watch the myriad display of emotions that ran rampant across Deimos' features. Ones that began with hope and childish joy swiftly crumbled into stony dismay and embittered doubt. The urge to lean forward and tuck the boy into the nook of his chest flared briefly in the Fire Sword's consciousness, but he dismissed it with a casual flick of his tail - hugs would not solve the world's problems for this stallion who was no longer a boy. In the years that Deimos had aged, however slowly his youth paled, Ignatius had remained as he was that eve he fell, sobered only with snippets of knowledge he gleaned from the mortal world that spun on. It was difficult to remind himself that this was not the Tides, that this was not his boy. That his crown had fallen, and been taken. That Deimos would ask him about the makings of greatness was nearly laughable given the prideful decay that the Fire Sword had permitted himself to succumb to. The blind faith in blood was as strong as ever, and just as damning. "That you question your finery is a start," he breathed in response, soot tumbling from the red glow that parted his dark muzzle. Given the composition of his form his emotions were difficult to read, not unlike he was when he'd been of flesh and bone, but the old king smiled now, and meant it. "When you think yourself great, is when you are not. When you think yourself safe, is when you will fall. When you think yourself needed, is when you will be overthrown." Fire filled the silence, speaking in crackles and flares that spooked away the shadows creeping in. "It is only when we search for improvement that we might find it." Action over inaction, isn't that how Ignatius so often thought? Why he led so many marches beyond his borders, so that he might show his strength to those that wondered at his weaknesses. Yet action is not to be confused with greed nor haste, both of which ultimately drowned the Fire Sword in rubble and ruin. "Know your people, love them, and in doing so you will never rule them, but you will lead them. If they follow when you lead, then you will know you have done something, magnificent." He exhaled slowly, the sound like a dying furnace. He blinked, dimming subtly. "We may mimic stone, but we are made of sea. Her waves are both strong and gentle, smooth and rugged, beautiful and dangerous. Do you remember the sea, your home?" He would have loved to bask in the glow of his father’s love, sagacity, and boldness along the intertwining dunes, half-listening to the cry of the gulls and the sanction of the waves, but the world had deigned they parted on mysteries, on deaths, on stories horrifying and bleak. The Reaper was forced to draw himself together again with no potential for the past, with no arts or spells to cast them into a hold of family and loyalty – he’d lost his way too many seasons ago. But to listen, to hear, to see, his father, even as a ghost with coals and embers, was enough (even if he couldn’t fight the longing, the yearning, buried and locked and sequestered in the nefarious annals of his blistered, scorched, embittered heart). The Lord was riveted, the King was plunged, down into the wake of memories and the finery of yesterdays, exploring the vivid contemplations his sire had to offer from beyond the grave: questioning his finery, not being tainted or succumbed by his dominance, by his supremacy, and he nearly wanted to lower his head and laugh – because naught was safe, naught was sacred, naught was ever written with anything but strife, danger, and treachery. Helovia offered them castles and riches, and took them away just as quickly as they’d been gathered. He’d watched souls he’d thought loyal turn their backs to him because they weren’t chosen, he’d listened to banshees scream at him from the top of their lungs, and he’d been reduced to shambles, to ruins, to splinters and fractures, of what he used to be. No conquering, no triumphant banners, no glittering reams of glory and rapture; just the twist of the knife, just the edge of the blade, shoved down through his shoulders and out through his chest. Ignatius ultimately crowned him ignorant at his next set of words, and to that the once-child, the once-prince, he once-future of the Tides did bow his head in shame, standing amidst the caves like a stricken youth. He didn’t know his people except as a mass of power, and no matter how much he presided over their hardships, no matter how many times he’d led them into sanctuaries or into battles, he only varnished a few faces, a few laughs, a few dreamers and their aspirations. He bled his soul into the roots of the firs and the avenues of the tundra and the wicked, deceitful rime of the glaciers, and he fought for their world so many times over, without asking them what they wanted, what they craved. He presumed, he assumed, he clung to avaricious grandeur and dastardly rapiers, and then billowed into the void as if he were naught but a mere stroke on the wind. Something cracked along his chest, and it burned, bright and vivid and soulless, a gaping wound unseen. He’d lost his herd before he’d even touched the throne, because it was easier to be apart, to be unaware, to be indifferent, then to give himself over to anyone or anything. The beast wanted to fight against his father’s advice, but they were too damning, too true, too right. So instead of balking, instead of gnawing against his teeth, he remained subservient to the fires of wisdom, and still bent his head towards the earth. “I understand. Thank you.” Comprehension was one thing – committing to the action was another one altogether. He would have yearned to open his mouth wide and relinquish all the queries boiling across his tongue (how how how when they disappeared from him or when they offered him smiles and he had nothing in return but silence and iniquity? ), but Ignatius boiled again, simmered along distant memories and the flood of days before his boy became stone, became rubble, became ruin. He had loved the sea, the touch, the taste, the feeling of power, the haze of rain scattered across his soul, the manifestation of elements clashing, rolling, colliding, melding and molding, but he didn’t speak of her, of the Tides or the ocean-girl, just flicked his downcast eyes towards his father’s burning stature and christened a promise, a pledge, a conviction. “I do.” They were in every inch of his soul, every fiber of his soulless, heartless presence, and they glimmered and dimmed throughout his days, restless and dreaming. He just never managed to find them.